Prototyping the electronic designs with a QFP, SOP, BGA, PLCC and other surface mount devices is usually a cumbersome process, leading to slower time to market the products. SchmartBoard electronic circuit prototyping system available from GLYN High-Tech Distribution makes prototyping of surface mount devices easy. Every company that designs a product involving electronics must first create a functional prototype. Hardware design engineers either use prototype boards to test a circuit or a custom printed circuit board (PCB) for the initial prototype. If they use a custom PCB, the cost can be high. Every time a change is made, they have to remake the custom PCB, which is both expensive and time consuming. A prototyping board on the other hand can save the engineer’s time and money by allowing changes to be made quickly. SchmartBoard/ezTM make prototype boards useful as they work with today’s miniaturised components. Two problems impede the user’s ability to handle solder surface mount components. 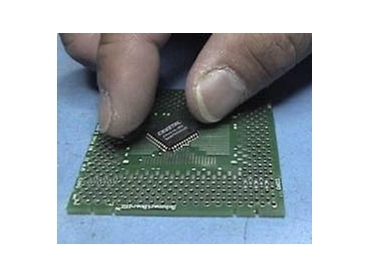 First, placing and holding the components in place correctly on the pad surface and second, hand soldering in small confined areas without creating short circuits. SchmartBoard/ez’s patent pending technology solves these issues. The solder mask is higher than the pads and not lower, which creates canals. The walls of the canals are made by the solder mask and the floor of the canal is the pad surface. The legs of the IC fit into this canal, thus allowing easy hand placement of the chip legs onto the pads. To solder the IC, the user can use a fine tip soldering iron and no additional solder is required. Using the soldering iron, the user can heat up the existing solder on the pads in each of the canals and can push the soldering iron from the lateral end of the canal to the medial end until the iron touches the chip’s leg. The solder stays in the canal, thus assuring that no shorts are created. This is repeated for each canal that has a leg to be soldered. In the case of ball grid arrays integrated circuits, the BGA is easily placed in the same manner as the ICs but a heat gun is used to heat up the existing solder on the pads instead of a soldering iron. Designs can also be easily debugged and recycled by using a modular approach with SchmartBoard/ezTM, where surface mount ICs can be soldered onto individual SchmartBoard/ezTM PCBs for SOP, QFP, PLCC, BGA and Through Hole ICs and then interconnected using SchmartBridgeTM connectors. Developing prototypes using the SchmartBoard system becomes similar to using Lego blocks where complicated prototypes can be built and tested easily by interconnecting fully tested and debugged SchmartBoard modules.